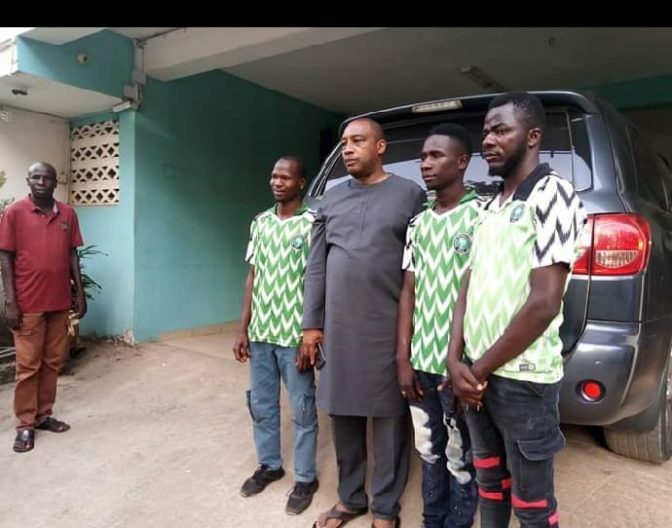 Three young men who rode bicycles to Abuja in celebration of President Buhari's victory have been rescued by a PDP chieftain after they became stranded. A Peoples Democratic Party chieftain has rescued three young men pictured below after they rode their bicycles all the way from Biu local government area of Borno state to Abuja just to celebrate President Muhammadu Buhari and senate leader, Ali Ndume of the All Progressives Congress (APC), over their election victories before they were stranded. A report by National Helm revealed that the men spent some days in Abuja as all their efforts to meet the with president and re-elected senator proved abortive. The three men later arrived at the office of Hon. Kudla Satumari, a chieftain of the Peoples Democratic Party (PDP) and managing director of Aerokeys Nigeria Limited. He welcomed them warmly and gave them undisclosed amount of money to take care of their problems and also transport fare to travel back to Borno.